A couple of weeks ago I shared the opening of Alyson Hagy's newest book, Boleto, and some quick facts about this beautifully written novel. Set in Wyoming and California, Boleto is complex story about a man and his horse, the conflict between following a passion and being pragmatic, and the unglamorous realities of the modern cowboy. It's also about the world of horses and the divide between the haves and have-nots. Will Testerman is a young Wyoming horse trainer determined to make something of himself. Money is tight at the family ranch, where he's living again after a disastrous end to his job on the Texas show-horse circuit. He sees his chance with a beautiful quarter horse, a filly that might earn him a reputation, and spends his savings to buy her. Armed with stories and the confidence of youth, he devotes himself to her training—first, in the familiar barns and corrals of home, then on a guest ranch in the rugged Absaroka mountains, and, in the final trial, on the glittering, treacherous polo fields of southern California. 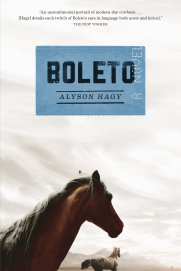 With Boleto, Alyson Hagy delivers a masterfully told, exquisitely observed novel about our intimate relationships with animals and money, against the backdrop of a new West that is changing forever. The giveaway: Thanks to Graywolf Press I am happy to be able to offer two of my readers with a U.S. mailing address a copy of Alyson Hagy's Boleto. All you have to do to be entered to win is to fill out the following form. I'll use a random-number generator to pick the two winners on November 15. As soon as the winners are confirmed, I'll delete all personal information from my computer and Graywolf will mail out the books. Good luck!